Wilson Trophy is known for creating exceptional, unusual and unique crystal awards that you can custom design online to suit a huge range of occasions and recipients. 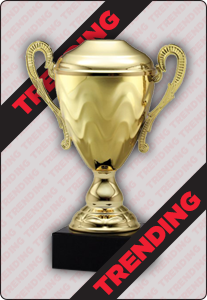 Our custom designed crystal awards can be outstanding in any way you choose. Whether your preference is for bold colors, modern design and unusual shapes, or you're looking for a sophisticated, elegant and traditional design, we can help you create the award you're looking for. Our crystal designs are ideal for adults of all ages, and can be awarded for excellence, effort or achievement in a corporate setting, or in sports or hobbies. Our crystal trophies will catch the eye of everyone in the room at all kinds of events, and are bound to provide the kind of recognition that will be cherished by those who receive them. Our crystal awards can also be presented at school awards ceremonies, to celebrate high achieving students or those with the best attitude in class, and more. From Little League Baseball heroes to football and soccer champions, any team member would be honored to receive a custom designed crystal award from Wilson Trophy. Simply get started with the few brief questions on our online form to begin the process of designing your custom award today.